“Pork Dumplings with Homemade Wrappers” was the very first recipe I Googled nine years ago. Somehow I got it into my head to make “jiǎozi” for the kids, but to my dismay, all the pre-made wrappers in the grocery store had egg. I was stumped. Out of curiosity, I logged into the interweb to see if there was a recipe for homemade wrappers. That simple question led me to Kuidaore, the first food blog I’d ever seen, and my mind was blown. Joycelyn Shu’s food was crazy and fussy and beautiful. She wasn’t a trained chef, she just read cookbooks. The food wasn’t for sale, it was just for her. Who makes beautiful food for a hobby and blogs about it? Fast forward a year, and I was that crazy person signing up for a free Blogger account and proudly posting my first recipe for family to see. It was 2008 and I used a film camera for those photos! How times have changed. Looking back on Joycelyn’s site, it’s nothing remarkable compared to the top tier food blogs now. At the time it was revolutionary. Now Googling a recipe is second nature, food bloggers are celebrities and cookbook authors. Careers and communities are built on food blogs. Ratatouille hit the theaters back in 2007 at the cusp of this culinary democratization. Thousands of little Remys took Chef Gusteau’s motto to heart. We hit the web showing our stuff, helping each other out on the way. I really have no idea why it’s taken me nine years to post this recipe, but Chinese New Year is upon us so here we go. 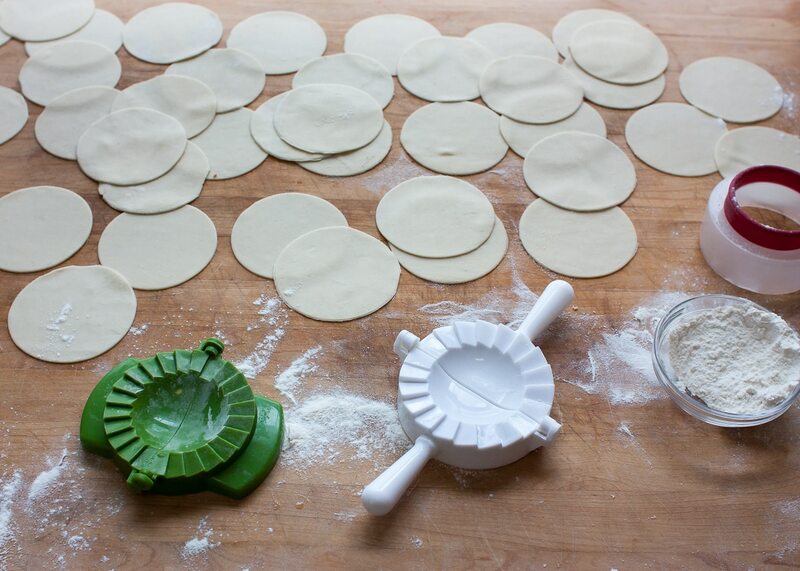 and use a dumpling press to shape. 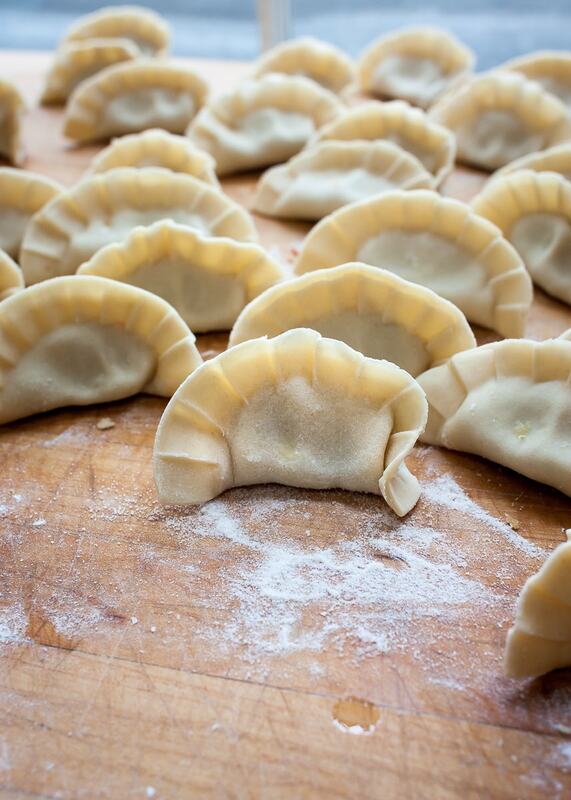 Use what you’ve got, and if you become addicted to homemade dumplings like we have…go buy a few gadgets. Cooking these up is super easy. I pan fry with some oil until the bottoms are golden brown, then add a cup or two of water and cover the pan to allow the dumplings to steam for 7-10 minutes until they are cooked through. 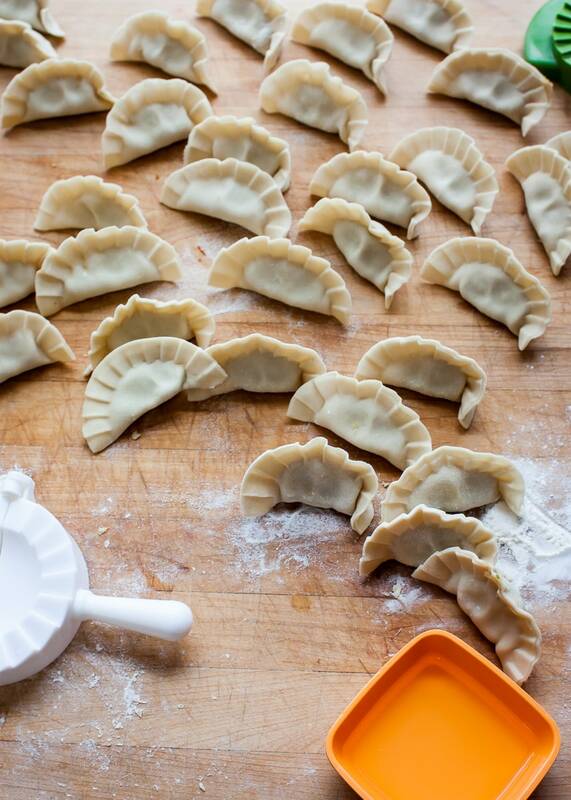 These take a bit of time to make now, but when your freezer has a few gallon bags of dumplings, you’ll be thankful. They cook up in a flash. And if that’s not enough, Chinese tradition says they bring wealth. That sounds pretty good to me. Line a large bowl with cheesecloth or a clean kitchen towel. Add the cabbage and carrot, toss with the 1 T. kosher salt and let rest for 30 minutes. Meanwhile, in a small bowl whisk the ginger, scallions, garlic, soy sauce, sesame oil, and 1/2 teaspoon salt. Gather the ends of the cheesecloth together and squeeze out as much water as possible, return the chopped cabbage and carrot to the bowl. Add the soy sauce mixture and ground pork to the cabbage mixture. Stir to combine. I just use my hands to get everything incorporated. Refrigerate filling while you make the dough. In a food processor, mix the flour and salt together. With the machine running, slowly add the boiling water the dough forms into a ball. 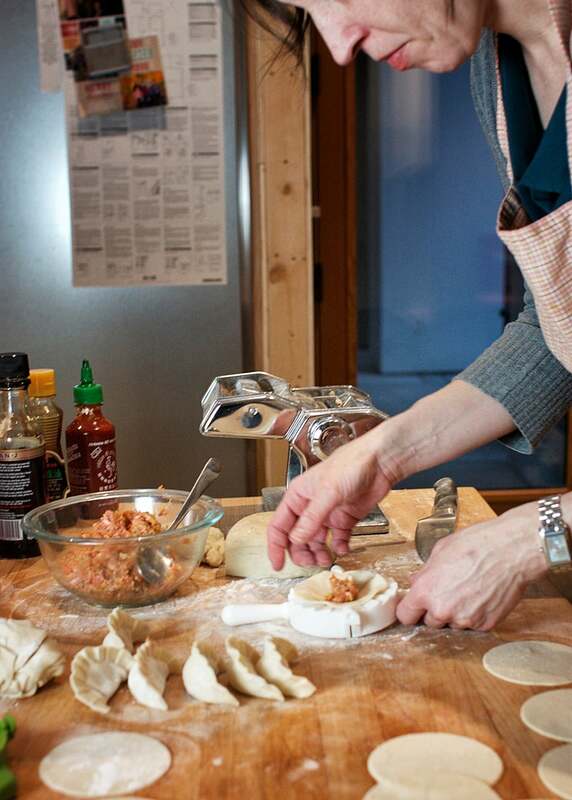 Wrap the dough in plastic wrap and set aside until you're ready to start making dumplings. 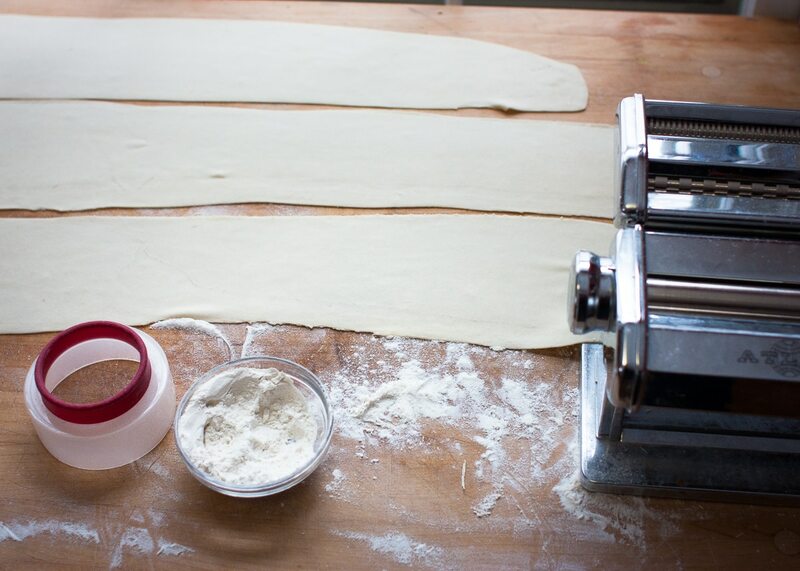 You can keep the dough in the refrigerator for a few days. .
My method for making dumplings is to roll a sheet of dough to #6 thickness in a pasta maker, cut rounds with a cookie cutter, and use a dumpling press to fill and form the dumplings. Feel free to make these by hand as well. To cook the dumplings, heat some oil in a skillet over medium high heat, add the dumplings flat side down and allow to brown. Once they are golden brown, add 1-2 cups of water and immediately cover to trap the steam in the pan. Allow to cook for 7-10 minutes, then remove the lid and allow the extra liquid to evaporate off. 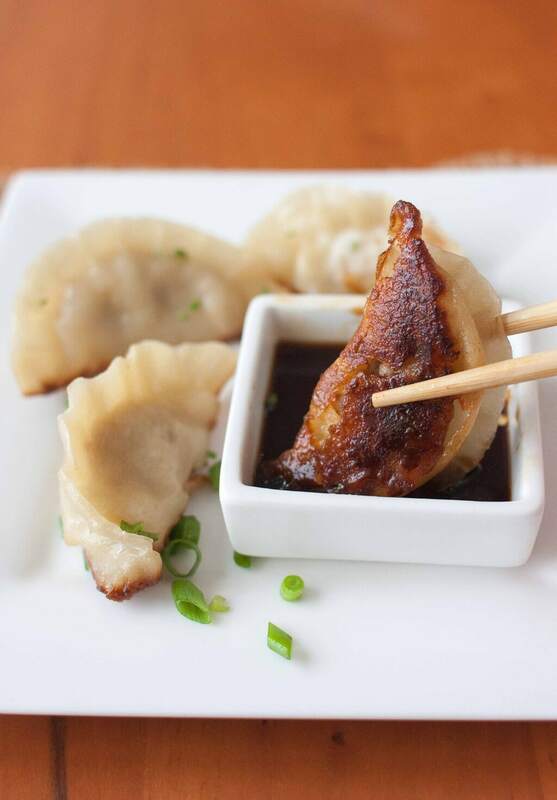 Serve with dipping sauce. 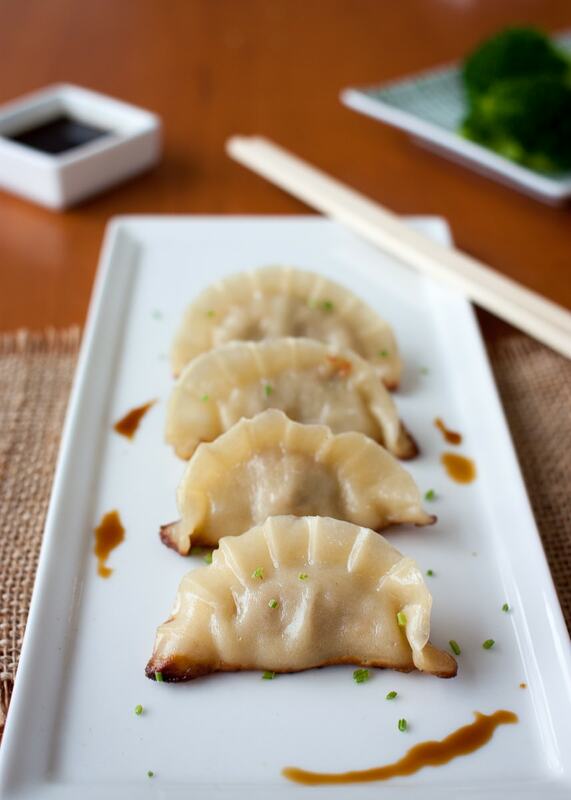 Alternatively, you can freeze the uncooked dumplings on a cookie sheet and move into freezer bags once they are solid. Cook straight from the freezer, no thawing required. Oh my poor dude and his wet-mitten eczema! These look great! I love dumplings. How much ground pork do you use? Oh heavenstobetsy! Sorry, it’s one pound. I’m trying out this new Cookbook recipe plugin, and it’s not quite a slick as I’d like. I must have “lost the pork” while re-installing an old version of the plugin because their update broke the blog! And I’m trying to switch to Mailchimp for my email updates…we’ll see what happens at 10am when it’s supposed to post. I’m sure it’s going to be a disaster. I have old RSS subscribers from Blogger that are probably going to get doubles, but Feedburner is defunct now and I can’t get those subscribers off that list! In some ways, the old Blogger days were much easier. But these days are much prettier! I’m nostalgic for Blogger and Google Reader, too. And once I posted a cake recipe–and left out the flour. Oops! Good question. I use San-J Tamari sauce. They have a gluten-free version that I started using a long time ago when my youngest wasn’t cleared to eat wheat yet. He eats wheat fine now, but I just liked the brand so I’ve stuck with it. It’s so much more complex than the watery La Choy soy sauce I used pre-kids. Sesame oil and sesame products in general are a challenge, most of the stuff in the grocery store has some sort of “Processed in a plant..bla bla…lawyers…bla bla”. Spectrum Naturals and Bob’s Red Mill are the worst. So unhelpful. I’ve been using Kayoda sesame oil for many years now. Sometimes I can find it in an Asian grocery story, sometimes I order it from Amazon, it lasts a long time in the refrigerator. It’s made in Japan, one of their most revered and established sesame oil companies, and sesame oil is all they do. They don’t make other oils. Is it a guarantee of no cross contamination? No, it’s Japan, so they don’t disclose like the US. But given the business model and extreme cleanliness reputation of the company, I felt safe giving them a try. This is off topic, but my source of peanut-free sesame seeds and tahini is “Sesame King” distributed online by Sunshine Foods. You can get their tahini on Amazon as well. Now I need to post a hummus recipe! Thank you so much! I appreciate the sesame seed and tahini info too! Can’t wait to start cooking!